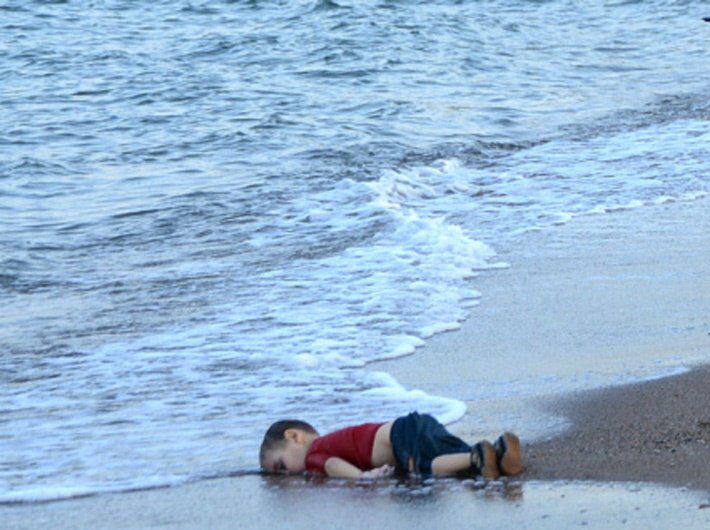 A photograph of a toddler's lifeless body, washed ashore in a land far removed from his birth place, has stired up the world's conscience. Three-year-old Aylan Kurdi died along with his five-year-old brother Galip and their mother Rehan, in a desperate attempt to reach Canada. The Syrian-Kurds from Kobane died along with eight other refugees early Wednesday. The father of the two boys, Abdullah, survived.The father’s family says his only wish now is to return to Kobane with his dead wife and children, bury them, and be buried alongside them. The image of of the little boy lying face down in the sand near Bodrum, one of Turkey's prime tourist resorts, taken by the Dogan news agency, made it to the front page of almost all major newspapers and websites of the world. And then the hashtag "#KiyiyaVuranInsanlik" ("Humanity washed ashore") made it to Twitter's top world trending topics. This is the tip of the refugee crisis troubling Europe. According to media reports, Teema Kurdi, the boy's aunt had tried to sponsor their migration to Canada but it was rejected in June. She is a Vancouver hairdresser who emigrated to Canada more than 20 years ago. Abdullah and Rehan Kurdi and their two boys were the subject of a “G5” privately sponsored refugee application that the ministry of citizenship and immigration rejected in June, owing to the complexities involved in refugee applications from Turkey. Kurds in Syria are bitrarily denied passports, and that makes it difficult for registering as refugees with the UNHCR. The Turkish government refuses to issue exit visas to unregistered refugees not holding valid passports. Syrians from Kurdish town of Kobane had last year fled to Turkey to escape violence by Islamic State (IS) extremists. Over the last week, there has been a dramatic spike in the numbers of migrants -- mainly from Syria, Afghanistan, Pakistan and Africa -- seeking to leave Turkey by sea for Greece in the hope of finding new lives in the European Union. This week, the Turkish government said the coastguard had rescued over 42,000 migrants in the Aegean Sea in the first five months of 2015 and more than 2,160 in the last week alone. A coastguard official told AFP around 100 people had been rescued by Turkish rescue teams overnight as they tried to reach Kos. The United Nations refugee agency UNHCR says more than 2,500 people have died trying to cross the Mediterranean so far this year. Migrants, many of whom have paid over $1,000 to smugglers for the risky passage, are taking advantage of the calm summer weather which makes this the best time for the crossing.